Doctors are still looking into the extent of Ryan Tannehill‘s knee injury, but the Dolphins are already weighing some outside options. Colin Kaepernick‘s name was raised within the Dolphins’ front office as potential insurance, Josina Anderson of ESPN.com (on Twitter) hears. Of course, Kaepernick’s name has probably been internally “raised” by a number of teams this offseason, but that alone doesn’t mean much considering that he has gotten only one workout all offseason long. What Kaepernick does have going for him, however, is that owner Stephen Ross has vocalized his support for him in the past. Last year, Kaepernick’s 49ers put up a solid effort against the Dolphins in a late November game in Miami. The QB completed 29 of 46 passes for 296 yards and three touchdowns and one interception, but the Dolphins ultimately won by a score of 31-24. After Tannehill, the Dolphins’ top backups are Matt Moore and David Fales. Play in the USA! Go play in Canada!! We don’t want him here in Canada either. HOW DARE HE EXERCISE HIS RIGHT OF FREE SPEECH AND RIGHT TO PROTEST!!! HANG HIM! THIS IS ‘MERICA! Now those rapists and wife beaters, them are some fine, upstanding young boys right there. lmao if the flag thing made u not like kap i think u were looking for a reason to not like him in the first place. He stood for something when everybody else in sports only stand for a paycheck. Chun, he peacefully protested the treatment of black Americans by the police. He kneeled during the anthem, he didn’t spit on, piss on, or burn the flag. What more could you really ask him to do? The socks with pigs on them was probably the worst thing he did, because it made him look childish. Go peacefully protest on your own time, not in your employers uniform and at work. I couldn’t agree more. He’s at work, getting paid to play football. 100% of his focus should be on football. Raise awareness by using your celebrity on social media, hold peaceful protests or whatever on your own time. He has no one to blame but himself for the position he’s currently in. I’m tired of the Kaep blackballed story. This league time and time again has showed it will turn a blind eye and take on a player with real LEGAL issues in order to win. I mean the Eagles took on the public with Michael Vick. Kaep didn’t even break the law! There’s all kinds of dirtbags in the NFL with long histories of abusing drugs, booze, women, and everything else out there. 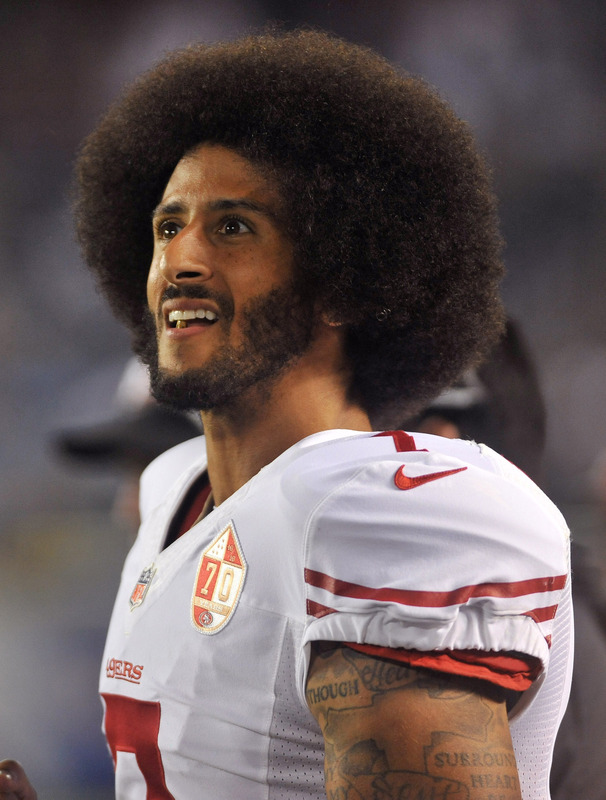 If Kaepernick was as good at football as he is at making himself the center of attention before and after the game, he’d have a dozen job offers right now. Im gonna take a knee on this one. I forgot kaepernick did something illegal. Oh wait he didn’t.